Darlene Meyers-Perry describes herself simply as a Tea Enthusiast. She candidly shares that her relationship with tea has taken her on many wonderful adventures allowing her to build friendships with other passionate tea lover's from all around the world. Also a student of tea, Darlene is working her way through the different levels offered by the Specialty Tea Institute. Darlene is an enthusiastic member of the Board of Directors with the Mid-Atlantic Tea Business Association. Darlene shares her love for all things tea in her fun blog, The Tea Enthusiast's Scrapbook. Darlene invites the reader to join her on a journey through a tea lover's archives. Her most recent post includes a beautiful array of photographs of the MATBA tea infused Pot Luck gathering. Darlene offered Lapsang Souchong Chicken Salad on small wheat buns. Since this event was held in July, Darlene added the decorative USA flags as a tribute to the Olympics that were taking place in London. Perfect! 1. Clean and pat dry the chicken breast. Coat with a thin layer of olive oil. 2. Season each side lightly with ground tea, thyme, paprika and adobo. Save some of the finely ground tea to mix with the mayo. 3. Heat up a little olive oil in a pan and then place the chicken breast inside to cook. Cover with a lid. Let chicken fully cook on each side. 4. After the chicken is cooked and has cooled off, cut up into small pieces and mix in red onion. 5. Mix the finely ground tea leaves into the mayonnaise and then mix this with the chicken. Serve on a small whole wheat buns, decorate with a thin slice of fresh cucumber and decorative picks. Marcella Farina, known as The Tea and Hat Lady is the current vice-president of The Mid-Atlantic Tea Business Association. Marcella shares her knowledge and love of the leaf through lectures, tea tasting seminars, and general programs pertaining to tea. Marcella tailors her programs to meet the tea interest level of the group while being both informative and entertaining. As a Certified Tea Specialist, Marcella is educated through the highest level of the Specialty Tea Institute, and continues to advance her knowledge through tea seminars, workshops, and tea tastings. Be certain to visit Marcella's Tea Journey blog, and join her community page on Facebook. Let her know that Nancy and Susanna sent you! Marcella shared two delicious items for the Eat Tea Pot-Luck at the recent MATBA gathering. The first recipe, Wild Rice Salad, is adapted from the Barefoot Contessa How Easy is That? while the second recipe, Matcha Mayonnaise is from Culinary Tea. Place the wild rice in a medium pot with 4 cups of water and 2 teaspoons of salt and bring to a boil. Marcella Notes: I altered the recipe by steeping two tablespoons of Earl Grey Tea in the hot water for 4-5 minutes prior to simmering the rice. Simmer uncovered for 50 to 60 minutes, until the rice is very tender. Drain well and place the rice back in the pot. Cover and allow to steam for 10 minutes. While the rice is still warm, place it in a mixing bowl. Peel the oranges with a sharp knife, removing all the white pith. Cut between the membranes and add the orange sections to the bowl with the rice. Add the olive oil, orange juice, raspberry vinegar, grapes, pecans, cranberries, scallions, 1/2 teaspoon of salt, and the pepper. Allow to sit for 30 minutes for the flavors to blend. Taste for seasonings and serve at room temperature. Serves: 4 - 6. The following recipe for Matcha Mayo was one of my favorite dishes at the Pot Luck. It produced a beautiful fresh green color, and very tasty flavor served with vegetables. Janet Young, from Over the Teacup, along with Nancy and Susanna form the founding members of the Mid-Atlantic Tea Business Association. Janet owned and operated a tea room in Camp Hill, PA for many years before family obligations necessitated the closing of her business. Although her tea room has closed, Janet continues to offer a myriad of programs to various organizations and businesses. As an attendee of several World Tea Expo events in Las Vegas and Philadelphia, and a trained Tea and Etiquette Consultant from the Protocol School of Etiquette in Washington, Janet continues to expand her expertise and knowledge of tea which she enthusiastically shares with many clubs and groups. If your organization needs a speaker, please contact Janet to see what she can offer. For the luncheon last month, Janet provided sliced Tea Pound Cake. This very moist pound cake was quite delicious. Janet also shared different ways to use the pound cake, as a base for a trifle perhaps, or cut the pieces with a cookie cutter for a pretty dessert. Beat butter and shortening at medium speed with an electric mixer 2 minutes or until creamy. Gradually add sugar, beating 5 to 7 minutes. Add eggs, one at a time, beating just until yellow disappears. Combine flour and next three ingredients; add to butter mixture alternately with milk, beginning and ending with flour. Beat at low speed just until blended after each addition. Stir in vanilla. Pour batter into a greased and floured 12-cup Bundt pan or 10-inch tube pan. Bake at 325° for one hour and 35 minutes or until a wooden pick inserted in center comes out clean. Let cool in pan 10 minutes. Remove from pan, and cool completely on a wire rack. Kirsten Kristensen, the current President of the Mid Atlantic Tea Business Association prepared Tea Infused Marbled Eggs as her contribution to the 'Eat Tea' pot luck gathering. Kirsten is a Tea Coach and Certified Tea Specialist, having achieved all 4 levels of certification from STI (Specialty Tea Institute). Her business, Tea4U LLC, keeps her very busy presenting educational and entertaining programs on tea, consultations, and promoting the health benefits of tea. In addition, she and her husband recently restored a 150 year old house in Oakhurst, NJ and opened The White House which provides the opportunity for tea events and a retail shop. You can also friend Tea 4 U on Facebook. Kirsten has graciously shared her recipe for Tea Infused Marbled Eggs. They produce a beautiful mottled tea stained flavored egg. The Mid Atlantic Tea Business Association recently held one of their quarterly meetings. Typically, meetings are held in member-owned tea rooms, providing the opportunity for tea related business owners to have the opportunity to network with other members, enjoy Afternoon Tea prepared by someone else, and to keep abreast of happenings in the world of tea. However, for this specific gathering, a pot-luck was organized where it was requested that all of the fare provided included tea in the recipe. What a colorful and tasty array of tea party food. It was a feast for the eyes and a dance for the taste buds. The menu featured such delicacies as Black Tea Mango Shrimp Salad, Earl Grey Sally Lunn bread with lemon curd, Ratatouille Infused with Yunnan Tea, Chai infused Viscor Date Balls, Baked Peaches with Ricotta and Peaches & Ginger Tea Streusel, Ginger Peach Bread & Butter pickles, a Matcha Mayonnaise with Veggies, Mint-Tea Chocolate Mousse, Matcha Green Tea Krispie Cakes, and so much more! The flavor of the Matcha (powdered green tea) was quite predominant in the Rice Krispie treats. What an upscale version of an all-American favorite! This plate full of yummy assorted tea party foods is a sampling of what was to be had on the tables. Oh, such goodness! Considered one of the top destinations for Afternoon Tea in New York City, the Astor Court of the St. Regis Hotel is the ultimate in elegance, class, and style. The stately room exudes a feeling of serenity and elegance, with fresh floral arrangements, pillars that rise endlessly to the ceilings, harp music playing in the background, gorgeous chandeliers that drip with sparkle. If you are planning a trip to the City, this is something you need to plan on doing, but be certain to budget the expense and save specifically for this experience. At $55.00 per person, you are certainly treating yourself to a lovely memory. My sister and I had the opportunity to enjoy Afternoon Tea at the St. Regis hotel in 2002 when it was a mere $35.00/person (which we thought was a real splurge at the time). The current menu is available on-line, and has changed since we were there. It consists of assorted sandwiches, large tasty scones, and petite pastries. The table is set with silver tea strainers, sugar crystals on a stick, a honey jar, lemon slices, orange marmalade and strawberry jam, lemon curd and matched china place settings specifically designed for the hotel. When we finished our plate of sandwiches, a second plate was replaced with another plate laden with fresh sandwiches. And when that plate was empty, they offered a third plate. The scones are on the top tier, kept warm under the dome. The variety of desserts, originally listed as 'Dry Cookies' on the menu, is now listed as Assorted Tea Cakes and Tarts. Our selection included one each of the tiniest palmier, a regular sized chocolate chip cookie, a rolled tuile, a tiny square fruit tart, a berry square, two jellied fruit candies, and a thin raisin topped cookie wafer. It was a very pretty assortment of desserts. Amazingly, we managed to cut everything in half so that we could each sample the sweets. They have an extensive tea list, and at one point engaged Elizabeth Knight as their tea sommelier. Also noted on their website and menu: proper attire is required, and to please refrain from cell phone usage. A box full of cookie cutters can be fun to rustle through... but annoying if you are in a hurry and looking for a specific cutter and are forced to pick up each cutter until you find the one you want. So, one afternoon, I decided to organize the box of cutters. Dumping the box, I grouped them into certain categories, depending on how I use them, specific holidays, animals, teacups, fairies, etc. With two sizes of Ziploc baggies, I labeled the appropriate bag and placed the categorized cutters in either large or small bags, letting the cutters rest flat. With the exception of a few categories, Christmas for example, most of the bags can be placed flat and I can see at a glance what is in the bag. The Christmas bag has the largest collection, but now they are all in one bag. I no longer need to toss aside teacups or fall leaves to find the holiday assortment. I simply grab the labeled Ziploc bag, and leave all the other cutters in the box. It's a system that works for me. Finally. There was a beautiful variety of dolls at the Doll-lightful Tea held in early August. Miniature dolls, baby dolls in christening gowns, and even fairies attended the event. But, it was the assortment of dollies that were enjoying tea time that captured Nancy's attention. These porcelain collectible Barbie dolls have clever names such as Mint Memories and Orange Pekoe. Both very valuable, Mint Memories was issued in 1988, while Orange Pekoe was introduced in 2000 with less than 4000 dolls produced worldwide. They are simply stunning dressed in detailed Victorian garb from head to toe, holding their precious cup of tea. Dollies and tea quite simply go together! We recently held a special event at Sweet Remembrances where everyone was invited to bring their favorite doll to tea. Susanna shared a doll that was given to her by our mother. She also brought Cedar's Build-A-Bear, lovingly called Camo-Bear and Angelica's American Girl Doll, Kaya. Nancy shared her Barbie doll, a treasure purchased in 1963 with birthday money from a dear aunt. Our menu included a cup of chilled Cantaloupe soup garnished with cream, coconut, pecans, and a mint leaf. Sandwiches included a cucumber sandwich, a blue cheese and pear doll sandwich with a walnut skirt, sliced chicken with basil pesto mayonnaise, zucchini tea bread with mascarpone cheese, and a petite egg salad topped with a 'dolly'. There was a scone course that included traditional English cream scones and lemon poppyseed scones with fresh fruit and assorted toppings. Dessert featured a soft lemon verbena cookie, apricot almond triangles, and a chocolate cupcake with a cream filling. Treva Smith, past president of the Central Pennsylvania Doll Collectors facilitated the sharing. She brought Laura which she acknowledged is lovingly spoiled! Our guests shared very special dolls, some from their childhood, others acquired later over the years. There is a special place in all of our hearts for our dollies! A baby shower took place in the tea room today. Susanna prepared the favors... a variety of herb plants, rosemary, sage, lavender, parsley, and more. Each was gaily wrapped with pink netting and perky pink and green ribbon. A card was tucked in amongst the herb plants explaining the symbolism of the herbs and flowers. Speaking through the language of flowers, silently wishing for wisdom, remembrance, courage and more for the mother-to-be and her guests. Each guest was invited to take home one of the plants as a remembrance of their time together today. One of the menu selections today featured one of Nancy's specialty cakes, shown here. Although difficult to discern in the photo, the baby booties are three dimensional. Baby showers are always such fun! Sugar and Spice, and Everything Nice, today. Absent were the snips and snails and puppy dog tails. Meet Friskie, one of three orphaned (now spayed, neutered, and, I guess, adopted) garden cats. It's rough being a Rosemary House kitty. You have to be cute for the customers and let them pet you. And you have to test out every batch of dried catnip by first chewing on it and then napping on it. And then you have to catch mice but you get in trouble if you catch birds. . . .
We just discovered that it's National Afternoon Tea Week! Although technically it's afternoon tea week every week at Sweet Remembrances, we're happy to join in the celebration of something so dear to our heart. An English specialty, this relatively new event originated in 2010. We're happy to share in the excitement of National Afternoon Tea Week which runs from August 13th thru the 19th this year. In celebration, Angelica is offering this tiered tray full of afternoon treats, just for you. The sandwiches include cucumber and dill rounds, domino sandwiches with ham and pepper jack cheese, sliced chicken with basil pesto mayonnaise, and sweet and savory cheddar on pumpernickel. Scones, of course, fresh from the oven. And a top tier of assorted little desserts, to include a mini cream pie topped with fresh fruit, lemon triangles, and petite teapot cookies. So, pour yourself a pot of tea, sit down, relax, and savor this calorie-free specialty tea to celebrate National Afternoon Tea Week! The Brown Betty... a traditional English tea pot known for its rounded shape and utilitarian use, was originally lovingly crafted using red clay from Stoke-on-Trent, England. It created a manganese brown glaze known as Rockingham glaze. The shape of the tea pot, coupled with the red clay is said to produce the best pot of tea. Do you use one of these sweet Brown Betty Tea pots to brew your tea? This past week included a visit to TranquilaTEA in Waynesboro, PA. Pretty and quaint, just the way you expect to find a tea room. We were each able to select our own tea, either iced or hot. Notice the little tag dangling from the lid, that marks the flavor of the tea held within. The pots are coordinated to the warming plate below.With the Queen's Tea, we were able to select a second flavor of tea. That's always fun! Salad was fresh and tasty with strawberries, almonds, and a poppy seed dressing. Then, the three tiered tray was placed in the center of the table. Such a feast! And such pretty presentation. The bottom tier included two types of scones, chocolate chip and the other scone included currants. A tiny portion of cream and lemon curd was on the table. The sandwiches included chicken salad, fresh cucumber gaily wrapped with red ribbon, sun dried tomato, tomato and feta in a pastry shell, pimiento cheese, and a chutney spread. Such a nice assortment of petite sandwiches in a variety of shapes. The top tier captured our attention and featured tasty morsels that included a shortbread cookie, a raspberry chocolate chip bar, and an apricot crumb. We would certainly return to this tea room! Someone celebrated a birthday around here this week. Specialtea themed cards have been arriving all week and grace the front of the fridge. An excursion to a fun tea room was also part of the festivities. We'll share more tomorrow about the tea. Shown here is the way the tea room 'honored' the birthday girl. A little placard in a teapot holder was placed in front of the guest of honor, and at the end of the Queen's Tea, a chocolate cupcake presented on a petite pedestal, complete with glowing candle capped the celebration. Singing was kept to a minimum as the 12 year old in attendance announced she was 'not going to sing here'. Tuck some bamboo shoots in the pot, water, and let it go! 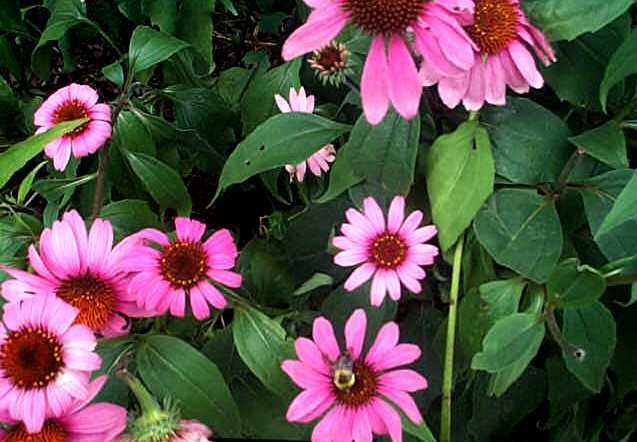 Echinacea or coneflower is a beautiful American Native Prairie Flower. 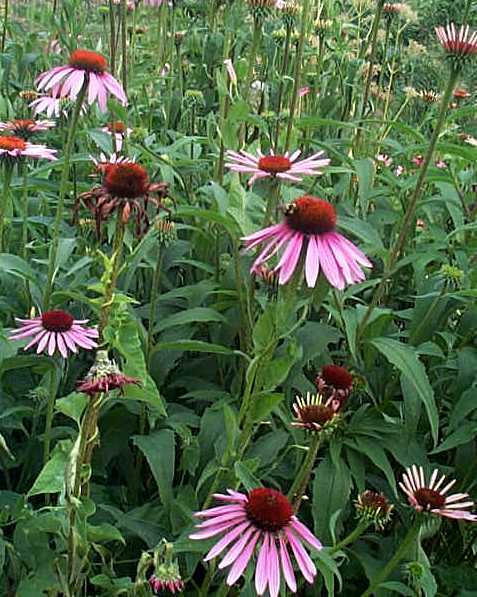 In recent years however, I am seeing more and more hybrids of Echinacea. A recent trip to a nursery showed this white flowered echinacea above and the one below entitled "gum drop". 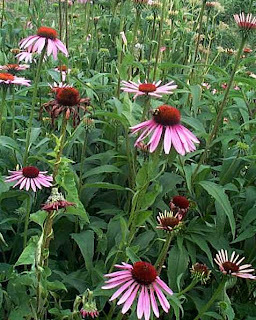 While hybrids are fun, the native Echinacea (below) offers colorful blooms for about a month in late summer, is disease resistant AND offers the medicinal properties of immune system boosting. When plants are hybridized to have different color flowers or a longer blooming season or for any reason really, the medicinal constituents in the plant are then compromised so often it is not nearly as effective medicinally. I thought this little herbal knot garden was just so unusual. 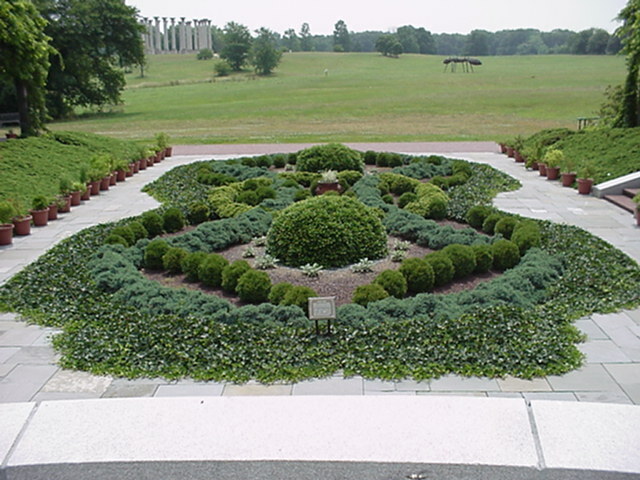 Typically, knot gardens are made with germander, boxwood, thyme all meticulously trimmed into a tidy little knot. This pair of knot garden which were located at an entrance into a RI nursery green house had tri-color sage, silver thyme, lavender and purple basil. Although my photos make it hard to spot the interweaving knot formation, look closely, it is there! 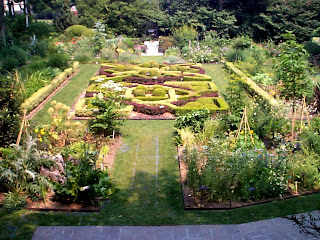 For comparison, below is a more traditional or formal knot garden from the Brooklyn Botanical Garden in NYC. I have a new favorite nursery! The Farmer's Daughter in Kingston, RI is a feast for the eyes. An unusual assortment of perennials, annuals, natives, herbs, succulents are all artfully arranged in their extensive nursery. Around every bend and behind every corner was another beautiful and creative idea for outdoor living. Whether it be the top of the garden shed or decorating the pool area. The flowers were arranged by complementary color harmonies. Garden statuary, pottery and more. If you are traveling along the beach area in Rhode Island, this gem of a nursery is worth a visit.